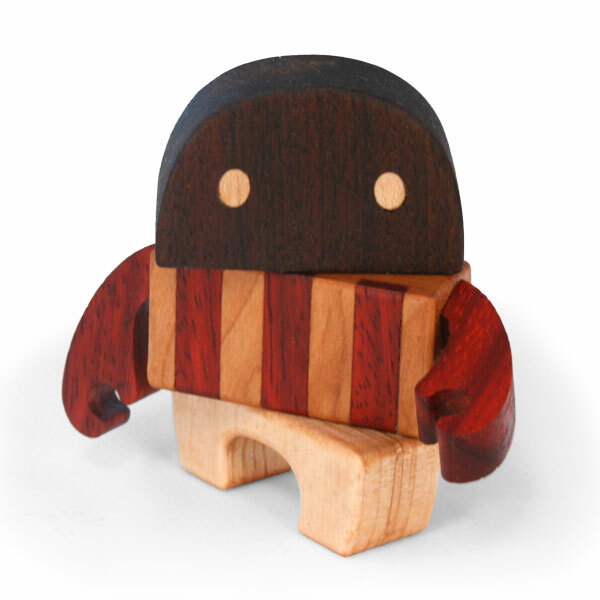 We are proud introduce you to "Auggie" the first of 4 figures from our premium mini figure Scrambled Wood series. These limited edition figures are comprised of 4 of our favorite hardwood species Maple, Walnut, Cherry and Padauk - all woods are naturally colored and finished with oil and wax, nothing is stained or dyed. The eyes and stripes are inlayed wood. Auggie stands 3 inches tall and has 4 points of articulation at his arms, waist and head! Auggie will be making his first appearance at Designer Con in Pasadena Nov 8-9. Come back tomorrow to meet "Bricker".